Many different people pick up litter and think about environmental issues, such as trash dumped in and around the river, water quality and nature restoration, in different parts of the river beds, in order to bring back nature to the basin. The Arakawa Clean-aid Forum is a Specified Nonprofit Corporation, registered at the Metropolitan Government in Japan. It is run by “participating organizations” (municipalities, businesses, schools, civic groups, and so on) that gather participants and organize volunteer cleanup activities in respective cleanup sessions (areas), mainly during Arakawa Clean-aid Months in autumn. These activities take place in a total of 150 different areas, from upstream Chichibu City to East Beach (Higashi Nagisa) of Tokyo Bay, and involve more than 10 thousand participants each year. The Arakawa Clean-aid Forum, an NPO, strives to expand the network of people who are aware of the importance of protecting the environment of the river, as well as the environment of the earth, through a wide range of activities. Picking up litter for a cleaner environment makes everyone feel good! One small action by one person can make a difference to society. Picking up litter leads to protecting creatures from the harm that litter does. The network of nature in the riverbeds that link to one another forms the base of a larger network that includes surrounding natural environments. Picking up litter to restore reed fields and wetlands contributes also to restoring ecosystems in urban areas. Reed fields and wetlands have the ability to make water clean. 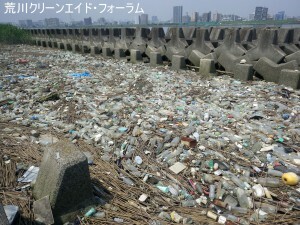 Removing litter that hampers this function results in healthier reed fields and wetlands, thereby contributing to making the water of the Arakawa River and Tokyo Bay, into which the Arakawa River flows, cleaner. The Arakawa River, which runs through the Tokyo metropolitan area and into Tokyo Bay, is a very important river that benefits the lives of many people. About 10 million people live in its basin, and it provides them with potable water and nurtures many living things. The Arakawa riparian zone is bristling with plants and provides precious habitats for insects, birds, fish and other creatures. 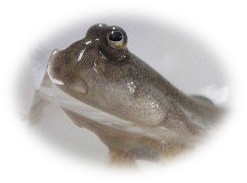 These living things, in turn, play a significant role that benefits the river. They help keep the Arakawa River water clean. However, trash is accumulating among the reeds and rocks. The adverse impact this can have on the ecosystem cannot be overestimated. The river is now littered with things like countless plastic bottles and illegally-dumped large appliances, and some of the trash is giving off a rotten vegetation-like smell of slime. At this very moment, the ecosystem of the Arakawa River is crying out for help. However, rubbish is accumulating between the reeds. The adverse impact this can have on the ecosystem cannot be overestimated. The river is now littered with things like countless plastic bottles and illegally-dumped large appliances and is giving out a rotten vegetable-like smell of slime. 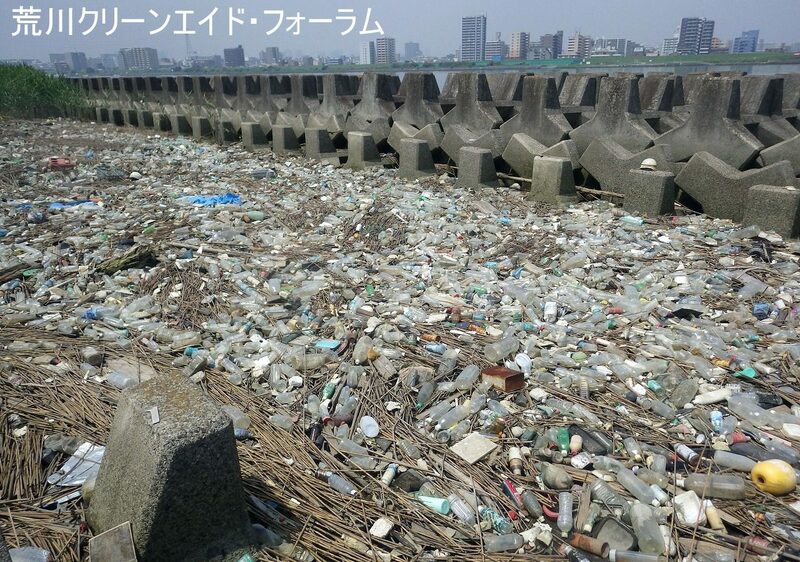 At this very moment, the ecosystem of the Arakawa River is crying out for help. 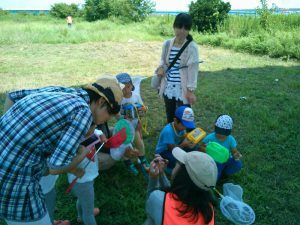 Join forces and pick up trash in and around the Arakawa River to restore nature. This is what “Arakawa Clean-aid” is about. Many different people pick up trash and think about environmental issues, such as garbage dumped in and around the river, water quality and nature restoration, in different parts of the high-water-channel, in order to bring back nature to the basin. It has been more than 20 years since Arakawa Clean-aid was launched in 1994. During these years, the amount of bulky waste dumped in the riverbeds has decreased and reed fields have come back to life in some places. Nevertheless, the river is still subject to an endless flow of litters and requires continuous cleanup activities. 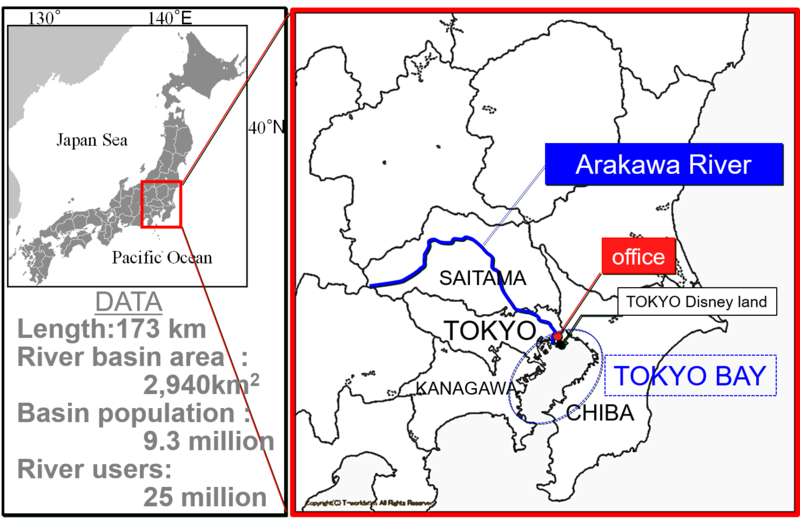 In recent years, this movement has expanded to involve participants of a wide range of ages, including elementary, junior high and high school students, and corporate employees who join Arakawa Clean-aid for periods of integrated study, as a volunteer program, and as a corporate social responsibility initiative. Arakawa Clean-aid is run by “participating organizations” (municipalities, businesses, schools, civic groups, and so on) that gather participants and organize volunteer cleanup activities in respective cleanup sessions (areas), mainly during Arakawa Clean-aid Months in autumn. During each session, participants count the numbers of litter items that they pick up. 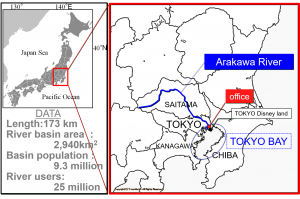 Collected litter is disposed of through cooperation with the municipalities, Arakawa-Karyu River Office (Ministry of Land, Infrastructure and Transport) and other related parties. The Arakawa Clean-aid Forum, an NPO, gathers statistics on the litter collected in all cleanup sessions. Increase awareness of the importance of environmental preservation through picking up rubbish! 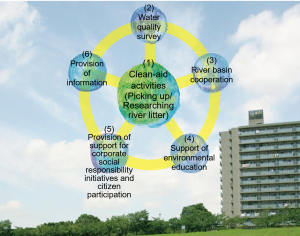 The purpose of Arakawa Clean-aid is to raise awareness of the importance of environmental preservation among citizens by working in partnership with “administrators”, “businesses”, “municipalities” and other related parties and providing people with the opportunity to think about nature in and around the river and environmental issues presented by the river through the experience of picking up litter. This is sure to encourage citizens to participate more in improving the environment of this river. Integrated activities are of vital importance in solving problems! The river keeps on flowing, bringing us both blessings and cursings. The important thing is to grow close to, and interested in, the river and work to improve the environment of the river. 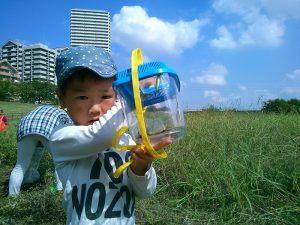 We carry out a wide range of activities, most notably picking up and researching litter, to raise public awareness by addressing issues related to the Arakawa River environment in an integrated manner! Participants of Arakawa Clean-aid count the numbers of river litter items that they pick up by category. Identifying the types and numbers of litter items allows each participant to raise their awareness of the issue. Moreover, the results of the research are translated into the development of measures targeted at minimizing the generation of waste to create a waste-free society. - The aim is to restore nature. - Participants count the numbers of litter items that they pick up. In recent years, the problem of river and marine trash has attracted attention as one of the most important global social tasks to deal with. River and marine trash not only impairs landscapes, but it also causes ill effects on the ecosystem. Plastic waste in particular has extremely adverse effects. Part of the trash such as fishing lines entangle and kill sea creatures. 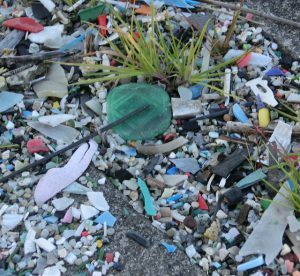 A worse thing is that plastic waste fragments become “microplastics” from the effects of wind, waves and ultraviolet rays. 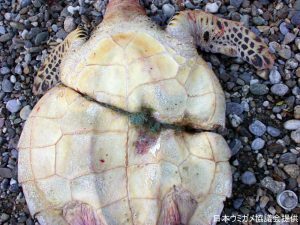 Such degraded plastic densely absorbs underwater hazardous chemicals and is inadvertently ingested by animals such as fish, seabirds, turtles, etc. Then, there is concern that microplastics are being conveyed through the food chain and are also affecting human diets. According to the Ocean Conservancy Report 2009, more than 50 to 80 percent of marine trash comes from urban areas. Waste materials, which are dumped in urban areas, end up in rivers and then drift out to the ocean. An incredible amount of trash that is drifting through riparian zones should be stopped as early as possible before it spreads out to the ocean and before it fragments into microplastics. The World Economic Forum and the Ellen MacArthur Foundation show in a report, “The New Plastics Economy: Rethinking the Future of Plastics,” that there could be more plastic than fish in the ocean (by weight) by 2050. Thus, River and marine trash is a most urgent social issue to resolve with every means available. In addition, we also provide nature observation programs, eco-tours and other programs to raise children who know how to safely play in and around the river. We provide corporate and government employees and other people with opportunities to demonstrate their social responsibility through participating in Arakawa Clean-aid, training courses of various kinds, and other programs. In response to growing demand, we are now inviting more companies to take part in our employee training programs. For more information, please refer to the relevant materials we have prepared. Our lifes are living through enjoying benefits from biodiversity. Biodiversity thus serves as a basis of the survival of human beings. In addition, biodiversity, as the particular assets of each region, also supports the diversity of unique regional culture. 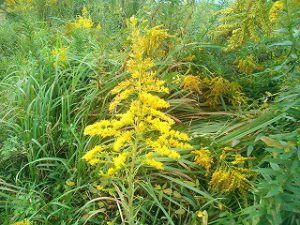 We remove non-native species such as a golden rods (Solidago altissima),Giant Ragweed (Ambrosia trifida) and burr cucumber (Sicyos angulatus) etc... at downstream of Arakawa river. Arakawa Clean-aid is perfect for first-time volunteers! You are always welcome, regardless of whether you participate on your own, bring a group of hundreds, or just casually volunteer once. first step as a volunteer worker with Arakawa Clean-aid? * For venues and other information, please refer to the leaflet for the Clean-aid Months in autumn or our official website (https://www.cleanaid.jp/). 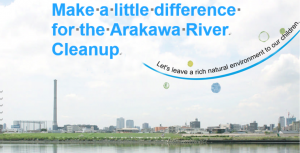 Each year we designate October and November as the “Arakawa Clean -aid Months”, during which many cleanup sessions simultaneously take place in many different riverbeds. Companies, schools and other groups of people are strongly urged to participate in these cleanup activities. * We hold a briefing for organizing groups in September. So even first timers have no reason to hesitate! 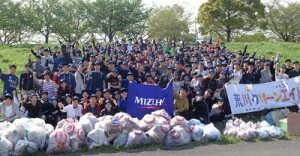 Groups who want to participate in Arakawa Clean-aid as “organizers” are recommended to do so during this time of year. If your group wants to organize a Clean-aid session on your own, our secretariat can help you with all aspects from selecting the venue to preparation. You are always welcome to hold one, not only during the Clean-aid Months in autumn, but at any time of year. * A coordination fee may be charged. For details, please contact the secretariat. We also provide training programs mainly for new employees, in which solutions to social challenges are explored through cooperation between corporations and civil groups. * For details, please feel free to contact the secretariat to get specific information and materials. When you want to clean up at Sumida City area.You should get volunteer stickers on Sumida City Office. Here is outline. * For details, please feel free to contact the secretariat. We hope that as many individuals and organizations as possible will support our cleanup and nature restoration efforts, which we carry out with the aim of passing down the rich natural environment to future generations. The Arakawa Clean-aid Forum is financed mainly by membership fees and donations. We invite individuals and groups to become members and support our activities. Members will receive our newsletters, information and reports (In Japanese). We sincerely ask for your support.